International or domestic, always affordable! 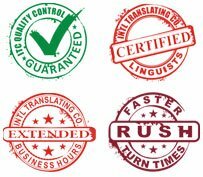 ITC translation services offers customers accurate and affordable translations within the needed timeframe – in over 200 different languages. We primarily focus on corporate and legal documents, translating everything from large technical manuals and legal contracts to training materials and websites. Each translation is completed and reviewed by professional native linguists, certified and trained to adapt any message you might have to the language and culture you need. We place as much care in translating, editing and proofreading your content as you did in creating it. Our success in winning and maintaining clients who rely on our translation services is a result of our consistent ability to deliver quick, accurate, and appropriately priced translations. Over 2,400 expert linguists in each industry – so you don’t have to wait. Trained, certified, native speakers – so your work is done right the first time. Specialties in Legal, Technical, Healthcare, Scientific, and Marketing translations – so the content of your project is accurate for your industry. A refined and continually improving translation process – so your project is on time. Three delivery timelines, in case you regularly need your projects done in a hurry. Your project is managed by a professional, experienced Project Manager – so you get the personal communication you need. We are committed to exceed client expectations – so you are more than satisfied. Your project is assigned a team of translators, proofreaders, quality assurance specialists, graphic designers, and technical personnel – so your project has the highest quality outcome. International or domestic – so you can use our services anywhere. We pay attention to the terminologies and nuances specific to any particular language – so your project sounds authentic. Our native linguists match context, tone, and style of the source language text – so your brand image is maintained. At ITC, we provide translation services that keep in mind your professional and linguistic needs. Our translation teams will successfully deliver your message to your target audience.